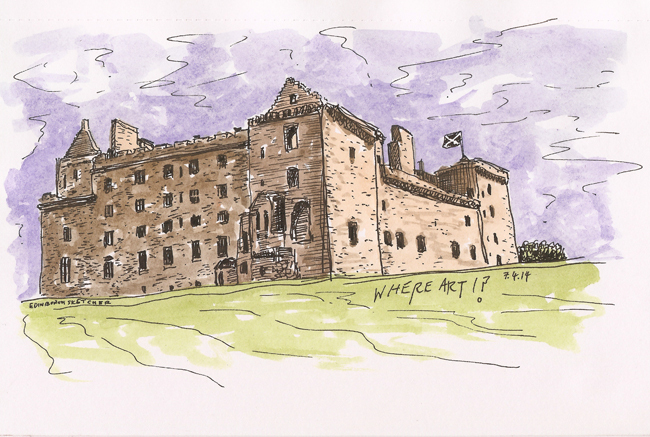 WhereArtI time folks and as it is the first Monday of the month, the answer could be anywhere in Scotland. Can you tell me where I’ve been sketching? There are leader board points on offer for the first three correct answers. Keep an eye on the facebook and twitter throughout the day for clues if they are needed. Answers to come later in the week. If you would like to donate a prize for the quiz get in touch HERE. Spot on everyone, or most of you. Linlithgow Palace it is. A fantastic place for running about pretending to be soldiers on horseback with the kids!! Claire McLean liked this on Facebook. Martin Gray liked this on Facebook. Linlithgow Palace from the Peel. Ronnie Roberts liked this on Facebook. @edinsketcher #wikisketching ! Embarrassing fail this morning for us.